financial woes, Edward and Edwin were able to strike up the band in lively tempo once again. That lie-back-and-take-it-easy chair was just what everyone wanted. Manufacturers from Michigan to Mississippi tried to copy its design, its mechanism, even its name - well after the patent and trademark were firmly established. No question about it - business for La-Z-Boy and Floral City Furniture was brisk. Other manufacturers complained about Floral City being both a retailer and a manufacturer. Little wonder. They didn't appreciate the direct competition. But in 1941, Edward and Edwin made an eventful decision to separate the La-Z-Boy reclining chair factory from Floral City Furniture. La-Z-Boy Chair Company was officially on the map with a building of its own. World War II began. Ironically, between 1941 and 1946 the new building produced no recliners at all. Instead, Woodall Industries manufactured specialized plane parts there. Production materials and labor were scarce, but the community worked together for the nation. La-Z-Boy rented out garages to make tank seats and crash pads - probably the most comfortable ones in war history. Company employees read about battles overseas, about local heroes and, unfortunately, about tragic losses, in La-Z-News and Floral Views. Many Monroe soldiers read that same newsletter to catch up on the behind-the-lines efforts of their friends and families. 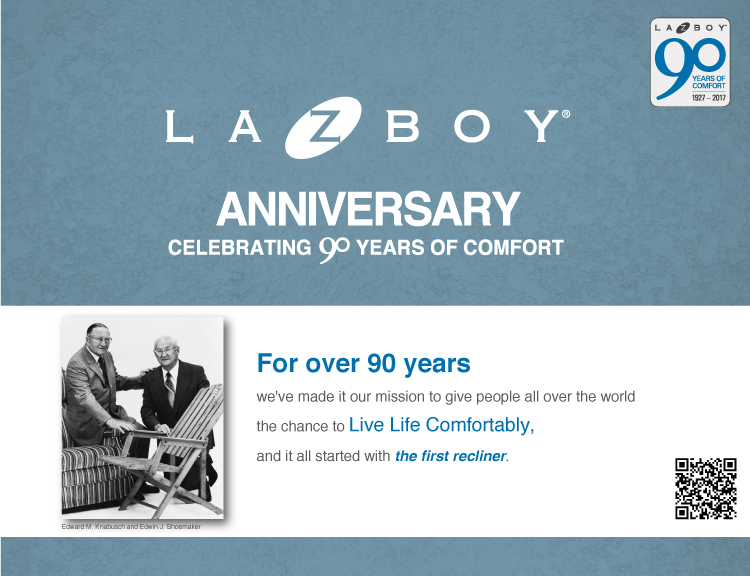 Even today, La-Z-News continues to keep members of the La-Z-Boy family informed.